Missoula, MN - President Donald Trump praised a Republican congressman for body-slamming a reporter last year, calling him a “tough cookie” and saying he thinks it might have helped him win election in Montana. His remarks praising Gianforte come amid an international furor over the apparent assassination of a Washington Post columnist, who, according to an account in Turkey’s Yeni Safak newspaper, allegedly had his fingers cut off and was decapitated inside a Saudi consulate in Istanbul two weeks ago. Gianforte, who attended the rally with the president, is up for re-election in November and faces former state legislator Kathleen Williams. The president’s next stop on his three-day trip out West is Arizona. That's your President, and your GOP rabosai...shep nachus! What the Prez said was “Any guy that can do a body slam — he’s my kind of guy”.. 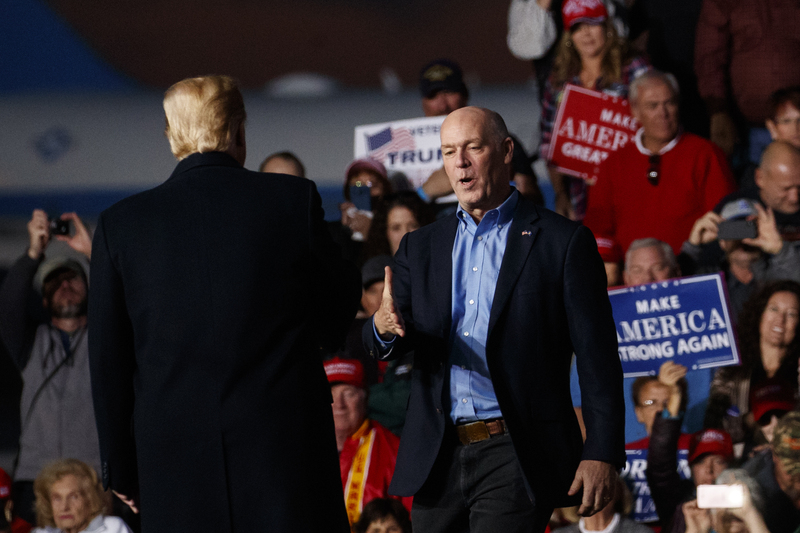 It has nothing to do with the headlines...Trump Praises Montana Congressman Who Body-slammed Reporter'. The truth is the headline is purposely misleading.. He did praise the Congressman, but not for anything to do with the reporter... and it was obviously said lightly, as a joke.. What a (O')bumer! There's just no bottom to how low this National Embarrassment can sink. I don't care about all of his "accomplishments" - Mussolini was famous for keeping the trains running on time. Mussolini was also famous for being one of the most well known fascists. Why is Biden promoting violence? “ There's just no bottom to how low this National Embarrassment can sink. I don't care about all of his "accomplishments" - Mussolini was famous for keeping the trains running on time. So the fact the US economy is doing great, unemployment is up, Army morale is up, Israel is being treated fairly, etc., etc. is not important to you? Were you happier having the silky smooth Anti-USA, Anti-Israel - Obumer in the White House, with all the "National Pride' he brought us?? The president is a chronic liar, denigrates people, has broken his marriage vows and wait till he pushes for a 2 state solution. Ah, B"H what mazel we have with such a Tough President ..now were prouder than ever to be USA citizen! When we see such apikorsim like Anon 1, pauline , Hashomer, katean hador etc etc who always defend anti torah laws like metzitzeh, tznious on busses, shechita, miaskav zochor and hate our president (BY the way , you shkotzim who always bandi torah when it suits you ..too much to mention) do you know you have to speak with respect regarding a leader of a country (see what G_D told moshe rabbeinu to speak with respect to pharoh parshes shemos see rashi(ask your local ehrlicher yid who that is...huh, this you dont like , eh well there's is no free speech in torah)..
Hashem yismor if that witch hillary wouldve won. anon 1&co; you and your communist party...remember,,, 'jews' like you braught the calamity of Communism' that killed millions and millions , and tried to obliterae judaism , godliness on this earth..well young man it will not happen...the alternate to republicans is communism which is also vilent forceful take over , what your kind has prooven...eg..sanders in restaurant,, senaters, representitves etc cruz etc who are harrassed and threatened. “ So the fact the US economy is doing great, unemployment is up, Army morale is up, Israel is being treated fairly, etc., etc. is not important to you? Hitler also fixed Germany's economic problem, he actually ran on an economic message. Would you of been happy with him, since his economy was doing great? Please moichal me...I understood "Any guy that can do a body slam — he’s my kind of guy"...“He’s a great guy, tough cookie” to be real; praise...man, what could I have been thinking? You are making excuses for the inexcusable. “ Hitler also fixed Germany's economic problem, he actually ran on an economic message. I usually try to avoid addressing nonsensical comments, but I'll make an exception. 1. The Kennedy incident was accidental; Gianforte's body-slam was not. 2. Many people praised Kennedy until the day he died - but NOBODY ever praised him for his involvement in the accidental death of Mary Jo Kopechny. The National Embarrassment actually praised a criminal for his deliberate criminal act. nothiin compared to your hillary witch, obama comunist etc and thats what counts not your babyish irrelavent idiocy like he called M13 animals...what mentel retard communist pelosi. she says 'how can you call a human image of g-d animal' unbelieveable 'sniff sniff' , all of a sudden shes religious the same torah with image of g-s says homois forbidden . By the way when one sins he loses that image . Back to our great PRESIDENT TRUMP, MAY G_D protect him, he retuned respect for military, police respect for our country even when diagreeing. You got to fight fire with fire. He is not different than the Antifa Nazi which the liberal media gives a free pass to. S E R I O U S L Y? US economy is great? For billionaires. For us plain Yiden the price of gasoline is up 35% in 2 years and the Mortgage is up 25% Even Clothing and other consumer good started to go up. I have no idea of the Price of Mega Yachts or whatever you talking about. Army morale? You are on a wrong blog budy. This is an orthodox Jewish Vosizneias. No one is the army and no one cares.The army ? Sending money to the Germans? Korea? S E R I O U S L Y? We would much rather if they give it to us. Really? My guy embargoed Iran. Your Messiah kissed the Saudis doing business with them after what they did 9/11 and made sure his first visit was Saudi Arabia. He openly states his Friends are Putin,NoKorea and the Saudis. Only a "deranged slimeball" will protect a POTUS who visit the Muslims who committed 9/11. Yoni, it seems you’re still smarting from your 2016 loss after guaranteeing us Hilary would win! Perhaps therapy might help? Yoni stop your nonsense, your rhetoric is nauseating. You spew the same nonsense day after day. If this was Obama he would be the greatest thing since sliced bread. The frum community is doing quite fine.